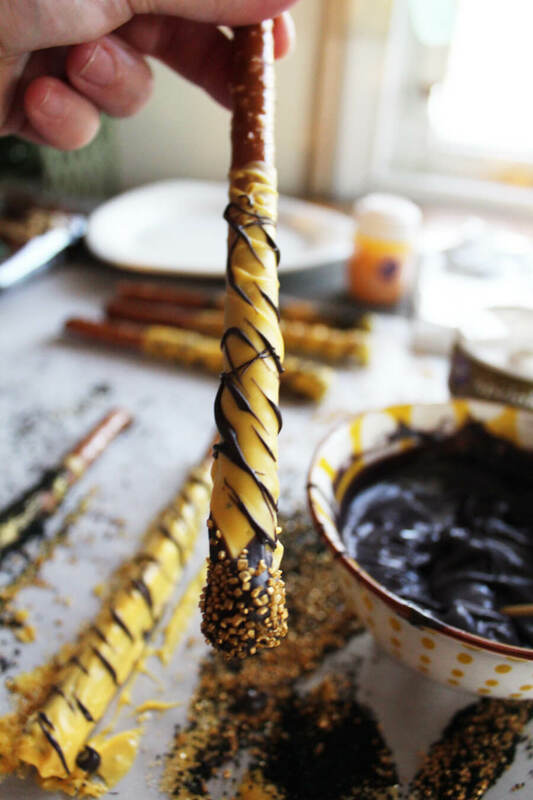 These Mizzou Tiger Tail candy coated pretzel sticks were SO FUN to make! 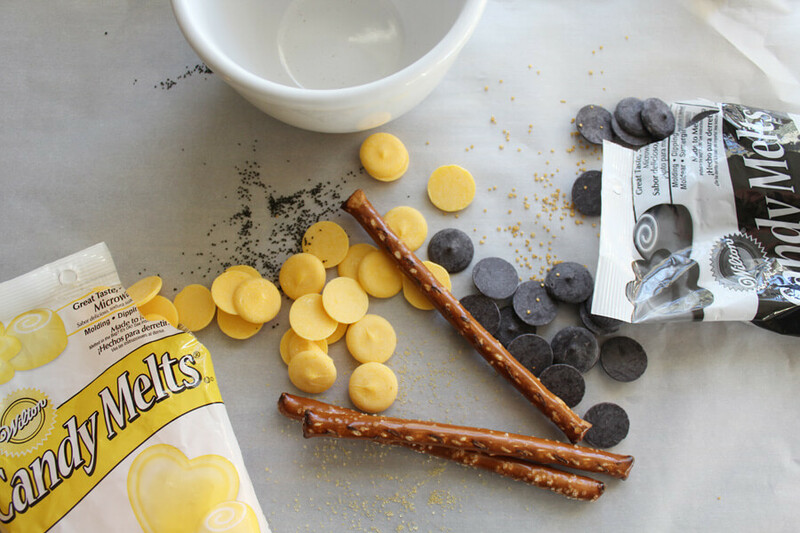 And just a few ingredients : pretzel rods, candy melts, and sprinkles. 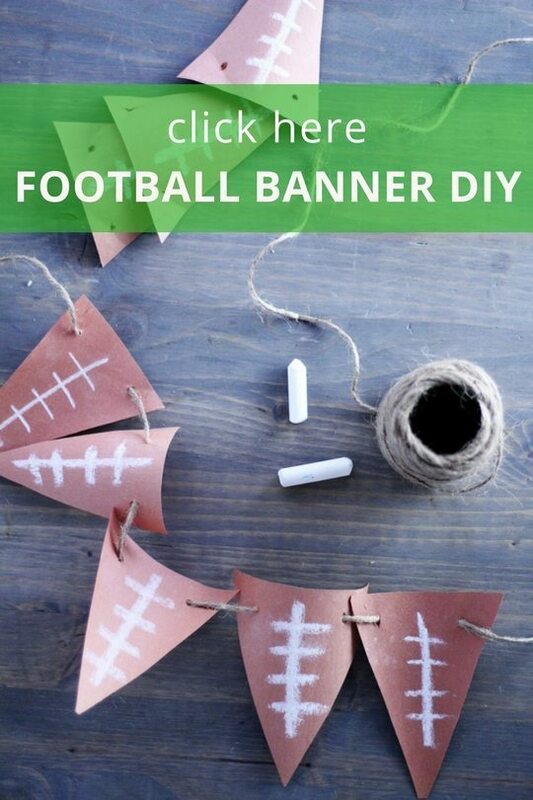 This is a great way to get your kids involved prepping for your next Missouri Tailgate. 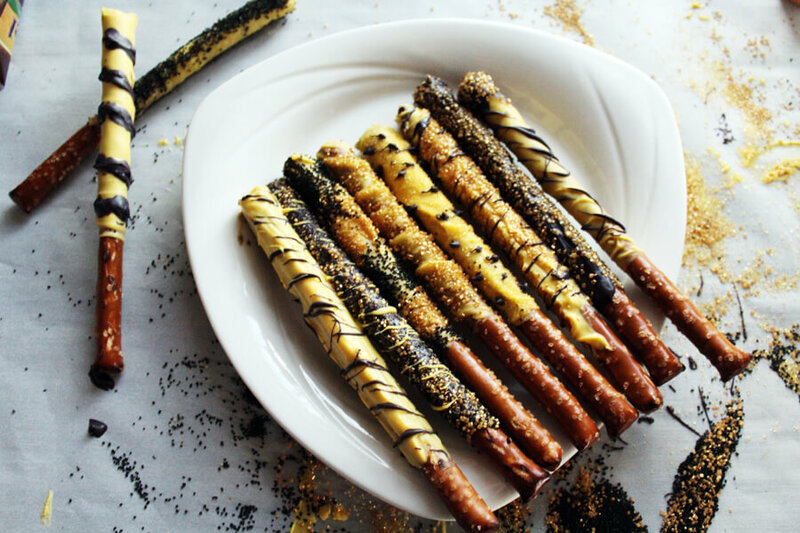 Each sweet & salty pretzel is uniquely decorated. 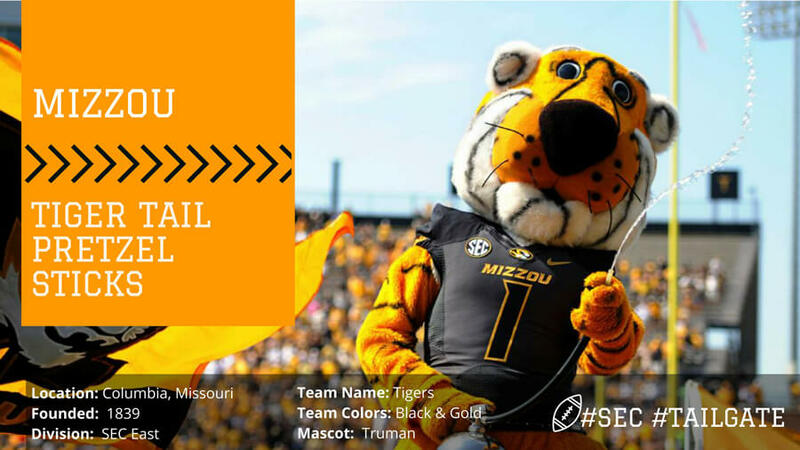 You can go Bold and Gold or show your stripes! 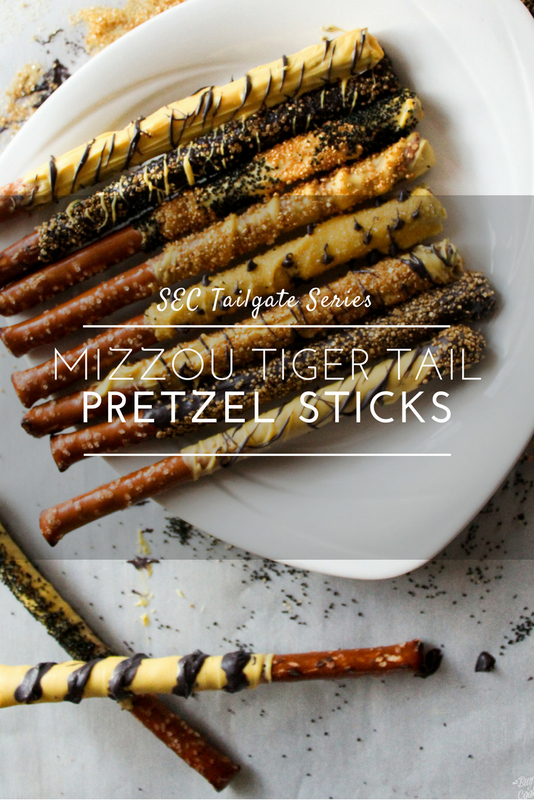 School spirit is definitely a must on SEC weekends, and this fun tailgate party snack is a great way to show your Tiger pride. Football season is our FAVORITE time of year. 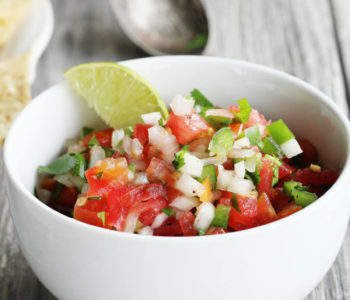 We love the weather, the crowds, the crazy football action, and of course, the food! 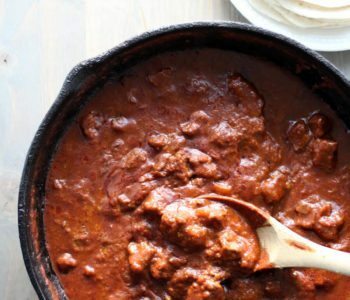 This year, we created a tailgate recipe for every team in the South Eastern Conference. 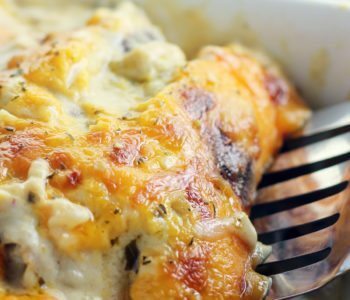 This Missouri Tailgate recipe was so much fun. And super easy. 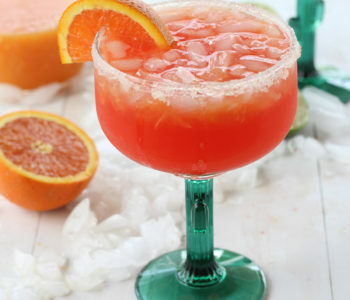 Seriously this isn’t a recipe, but it is tailgate inspiration for your next party. These are almost as cute as Truman the mascot! and melted them according to package directions. Just microwave, stir, and keep going until it is smooth. 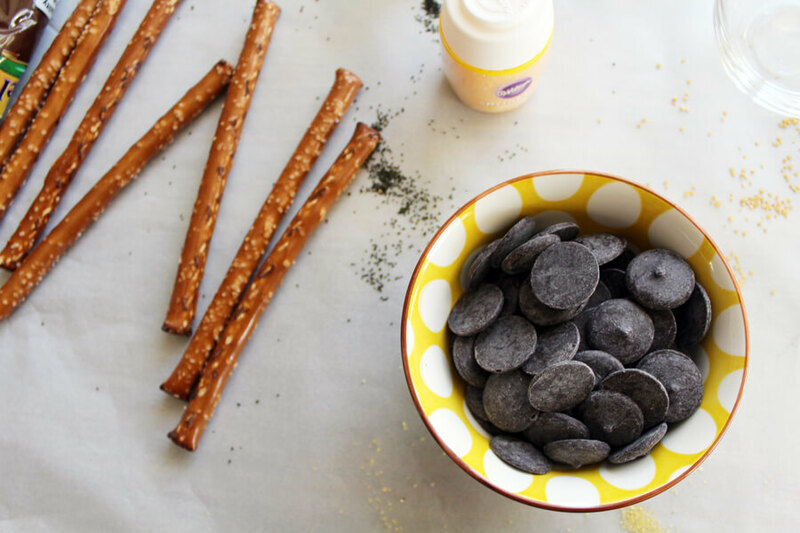 Spoon some of the coating into a cup so you can easily coat each salty pretzel stick. Twist and turn and remove. You can use any sized pretzel stick you want. We went for the salted pretzel rods. Great size and the salt goes so great with the yummy candy coating. 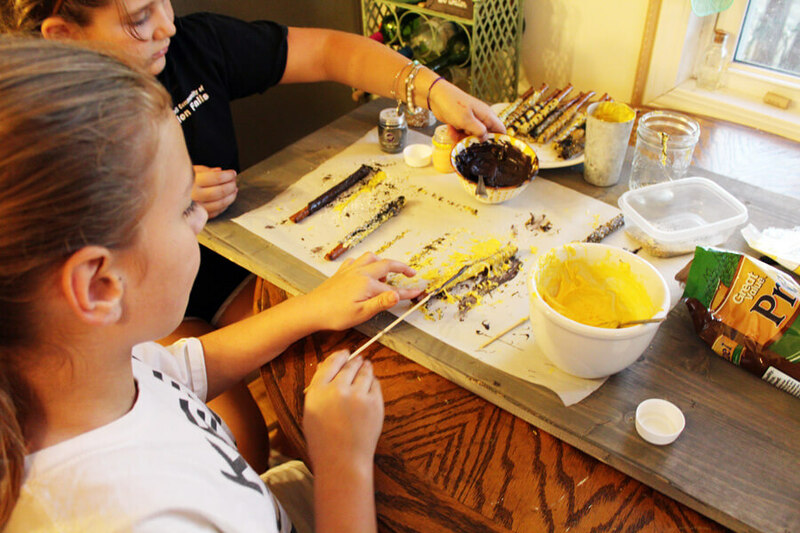 *Note, by the end of this process, the kids were in charge of these candy coated pretzel sticks and they just slopped the candy coating on with a spoon. Hey, whatever works, right? If you do a lot of candy coating, Wilton has the best little device to keep your candy coating melted to the perfect temperature while you work. 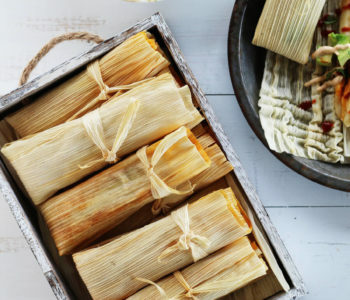 This is worth it if you are making a double or triple batch of these for a crowd. Get creative! We created tiger stripes in a few different ways to get different results. We carefully layered some on by alternating sprinkle glitter colors. On others we used a wooden skewer and drizzled the melted candy on in a tiger stripe pattern. Have fun! Pretty sure this one was my favorite. Decorate each pretzel. 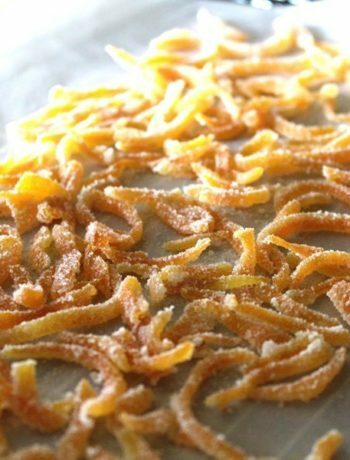 Place them on wax or parchment paper until hardened. This takes about 10 minutes. 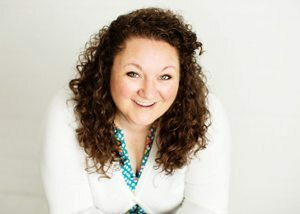 Then they are ready to share and eat at your next Missouri Tailgate. 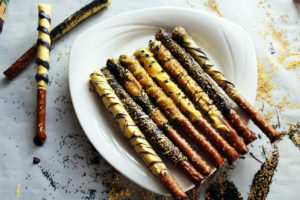 Fun candy coated salted pretzel sticks, great for game day, parties and more. Place a large sheet of parchment paper over your working surface. In a microwave safe bowl, heat the yellow candy melts according to package directions. Microwave 30 seconds, stir, repeat until melted through and smooth. Repeat the process for the black candy melts. 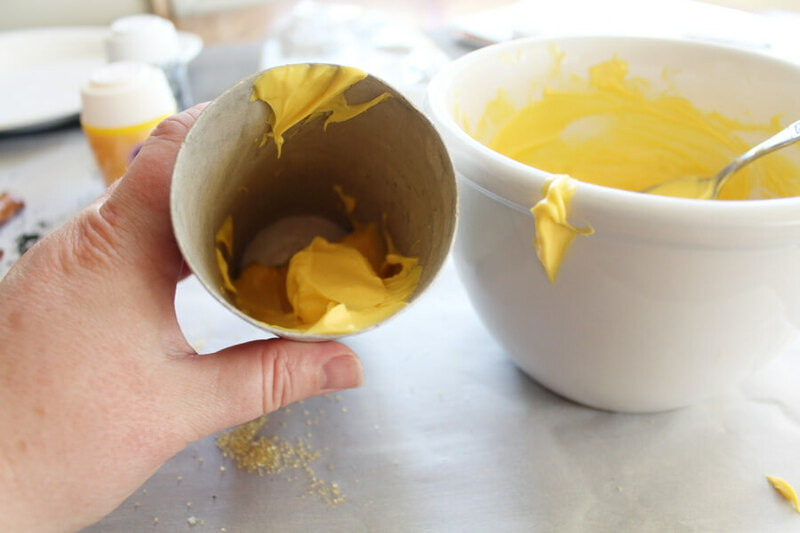 Either spoon some of the melted candy into a small narrow cup, or use a spoon to coat the pretzel sticks in desired color. 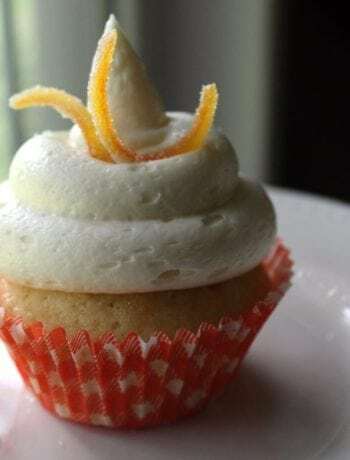 Top with sprinkles of desired color, create tiger stripes with alternate color, or whatever you would like. 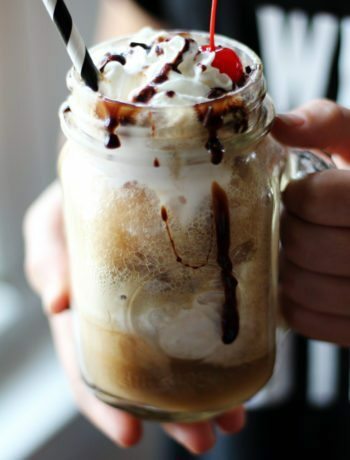 If the chocolate hardens, reheat as needed. *Note: work with one pretzel at a time. The candy coating will harden quickly. 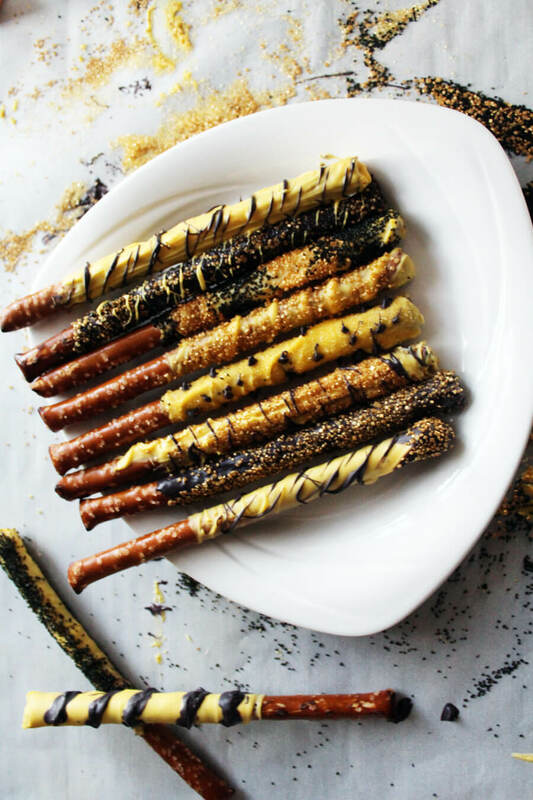 Let the candy coated pretzel sticks harden for about 10 minutes, then serve and enjoy! Okay, LOVE these. Chocolate covered pretzels are one of my all time holiday faves, and this team spirit version is too cool. The kids and I are going to have so much fun with this!